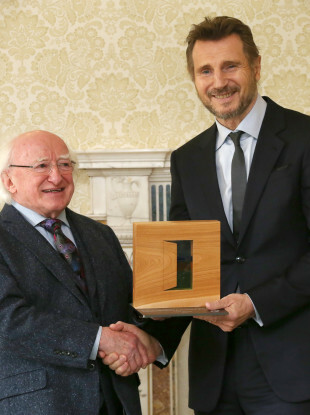 Michael D Higgins presenting Ballymena's Liam Neeson with a Presidential Distinguished Service Award for the Irish Abroad. ALMOST TWO THIRDS of people are opposed to Irish citizens living in Northern Ireland being given the right vote in presidential elections, according to a new poll. The Claire Byrne Live/Amarach Research poll for TheJournal.ie found that 62% of people were against the proposal with 27% in favour and 11% saying they didn’t know. Various proposals have been mooted in recent years related to the extension of voting rights, with the government last year proposing a number of options for a referendum. The 2013 constitutional convention recommended that a referendum be held on the issue and those in favour of a change have pointed to the fact that Ireland is out of step with other countries. The UK has allowed its citizens to vote abroad since the 1980s, with a total of 23 out of the 28 member states in the European Union allowing voting for citizens overseas. While there appears to be no prospect of allowing citizens abroad vote in Dáil elections, politicians have argued that citizens should be allowed choose who represents them. Fianna Fáil Senator Mark Daly has described the right to vote as the most “fundamental right of any citizen”. Email “Most people are against Irish citizens in the North voting for the Irish president”. Feedback on “Most people are against Irish citizens in the North voting for the Irish president”.